Perhaps one should never look at a Stark Brother's Catalogue in January. Like post childbirth, you forget the labor, and five new trees arrived in April. These trees were going to be planted here and there, requiring individual fencing. The guys dug the large holes together, a difficult job since the soil was very hard from an extremely dry fall. That is something we learned; it is almost impossible to dig a hole in dry dirt, whether manually or with the post hole digger, and we hadn't thought to soak the areas beforehand. After the holes were dug, and all the amendments ready, Todd and I planted the trees, and Larry surrounded them with fencing. 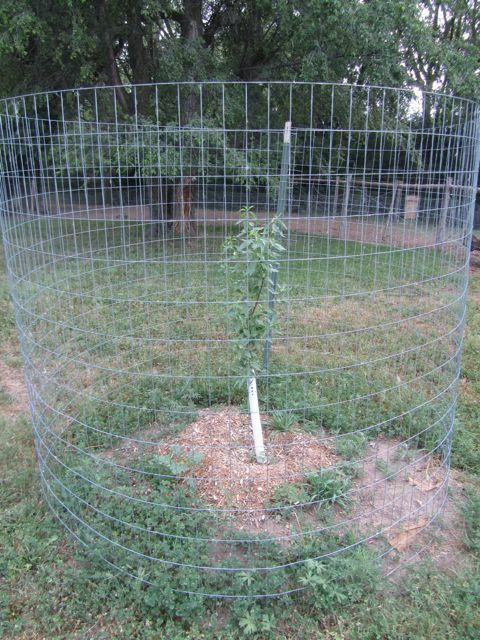 We now have two filbert (Hazelnut) trees across the lane, an all-in-one almond in the yard, and two trees close to the corral. One is a butternut tree which will grow 40 or 50 feet high and provide great shade. The other, is a mulberry tree that bears extra sweet, 1 1/2 inch long mulberries. At this writing, mid-June, they are all leafed out and doing well. We planted the mulberry tree in honor of the family babies we weren't given the chance to hold. There was no ceremony; we didn't even discuss it during planting, but Larry and I had decided to do this and we knew it in our hearts. Amy and Dave had just had a miscarriage, and in sharing their grief, it brought back memories of Jason and Krista's and our miscarriage. When we look at that beautiful tree, full of birds eating the lush berries, we'll not forget. Side track: I love the "Little House" books. I first read them as a kid, then aloud to our children, and twice since. Now, we have read a similar book, still from long ago, but yet closer to our time. It is about the depression years in rural Iowa, and depicts everyday, ordinary life, much as the "Little House" series. I'm from an Iowa farm, and Larry lived in the small town 1 1/2 miles away, so we felt right at home in some of the stories. We would like to recommend: "Little Heathens" by Mildred Armstrong Kalish. It is fortunate that she has recorded this place and part of history. *It was in this book that we first read about butternut trees.